Petermann Glacier ice area loss is that it has been gradual, a little at a time, no big all-at-once 100 sq km area loss. With Greenpeace support, we’d installed time lapse cameras and GPS. Surprise was that what we observed was a gradual ice area loss and not yet to the tune of the expected 100 sq km ice area loss. So far, the area loss is ~10 sq km. 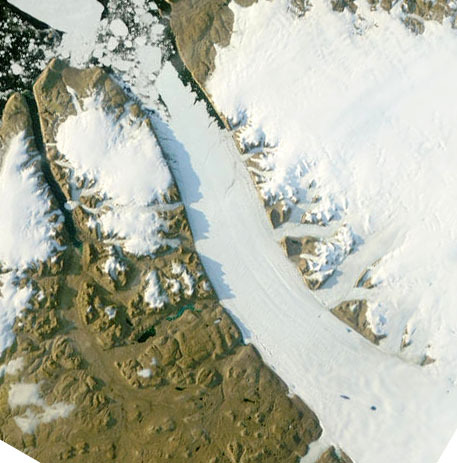 Image Caption: Petermann Glacier 29 Aug, 2009. This entry was posted on Sunday, August 30th, 2009 at 9:50 am	and is filed under Uncategorized. You can follow any responses to this entry through the RSS 2.0 feed. Both comments and pings are currently closed.